When Hyundai launched the 2015 Sonata they created a lot of tech buzz because they said that the model with the tech/navigation package would get updates to Android and Apple CarPlay. The Android Auto update was released earlier this year. We can tell you that we have word from a source familiar with the matter, that Hyundai will be making an announcement regarding Apple CarPlay within the next few weeks, we suspect it will an update to Apple CarPlay, as promised. 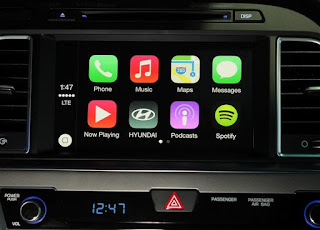 The original news release stated “By integrating CarPlay into our core-volume Sonata, Hyundai is one of the first volume manufacturers to bring CarPlay to market and it will be available on 2015 Sonatas equipped with navigation later in the 2015 model year.” We have seen CarPlay working in Hyundai Sonatas at the 2014 LA Auto Show as well as CES 2015. However, GM was the first to launch CarPlay across its vehicles. It is a little past the original estimate for deployment but the update to Apple CarPlay is coming sooner than later. Previously, when Hyundai released the update for Android Auto it was first available by going to the dealer for the update. Later on, the update was available online for download to a computer than transferred to the Sonata via a USB drive. We suspected the update to CarPlay will be done in a similar way. For CarPlay to work properly it requires a Lightning connector and an iPhone with iOS 8 or greater. Hyundai plans to no longer offer CD players in its 2016 model year vehicles and instead only offer digital music options. There is another issue that we are investigating for a reader. There has been great confusion over if there will be Android Auto or CarPlay for the 2016 Hyundai Sonata Hybrid. An owner of 2016 Hyundai Hybrid has been trying to find out if and when his Sonata Hybrid will be updated to Android Auto. He has contacted customer support and tried to contact the public relations staff of Hyundai. When we contacted Hyundai we were told that they are investigating the matter. Some articles have Hyundai PR people stating that Hyundai Sonata Hybrids will have Android Auto and CarPlay. The Hyundai Sonata Hybrid owner is a keen Android fan and wants the navigation features of Google Maps. There are rumors that the reason Hyundai does not have Android Auto for the 2016 Hybrid Sonata is because Google has not given them the software. There is usually a problem switching out head units/stereos with cars that have electric functions. For instance if you have a basic radio in a Nissan Leaf without the electric CarWings app, you can replace the radio. Electric cars often have too many proprietary programs running to aftermarket makers such as Pioneer or Dual to accommodate. We will keep you posted when we find out more about the Hyundai Sonata Hybrid Android Auto confusion.